The home screen Savee is the page where you are when you open the application. You have the first blue indicator showing the percentage of remaining battery before it runs out. In green you have the estimated cooldown indicator displaying only if the device is plugged in. In the black frame you have 5 information about the remaining time. The energy button selection offers different modes: Powerful; Normal; Saver and Custom. The Custom mode is based on the Normal mode that you can customize to your needs. The display panel allows to set different brightness and standby phone strategies. You can add an application exception that prevents standby phone when they are opened. 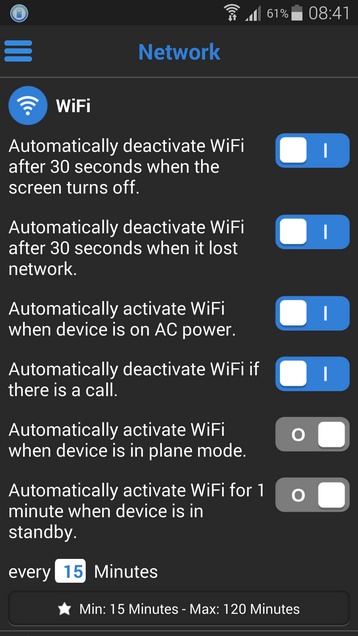 Night mode automatically deactivate every connection without the phone (network connections will not be reactivated once the screen turns on). Default time is 21H00 to 6H00 every day of the week (Deactivated for Powerful mode). 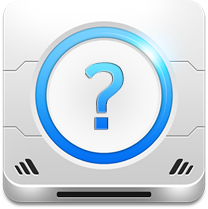 The pocket standby function works when the device screen is off and the sensor is covered. This means that the unit is in the pocket and so all the phone options have been suspended after 3 seconds instead of 30 seconds. The network component is used to manage and configure the entire set of connections for your phone. When the screen turns off, the WiFi, Bluetooth and mobile data can be switch off after 30 seconds. They switch on automatically when the screen turns back on. Note: There may be a delay between the ignition of the screen and reconnection. 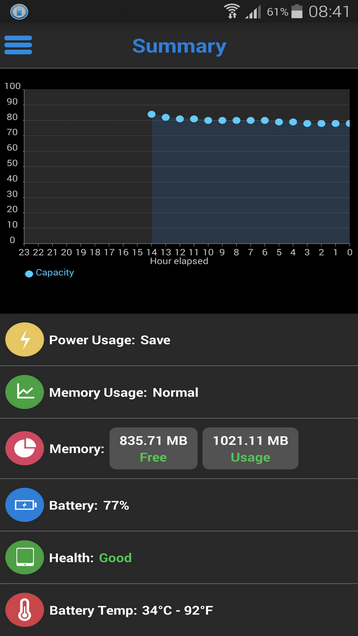 This does not depend on Savee but the phone (power, network proximity ...). Note: Savee restore the previous state of network. If, for example, the WiFi is ON before the screen turned OFF then the WiFi will be restored ON after the screen turned ON. If the WiFi is ON and the network is lost and and the screen turned OFF then the WiFi will stay OFF after screen turned ON. 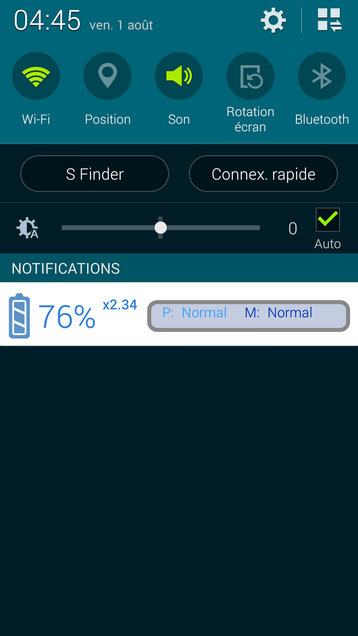 Savee can from a defined level of remaining battery automatically disable all network connections except the phone. You can set a list of exceptions that allow or not the applications to access to the Internet. In the part of mobile data Savee can also enable or disable 3G/4G connection according to your choice. In the part of automatic connection (Activated by default for Powerful and deactivated by default for Normal and Saver modes) between 9:00 and 10:00 every day, the function enables the WiFi first, then if there is no network found, it switches to 3G/4G connection to perform data update. The power panel allows you to control the power of the phone. 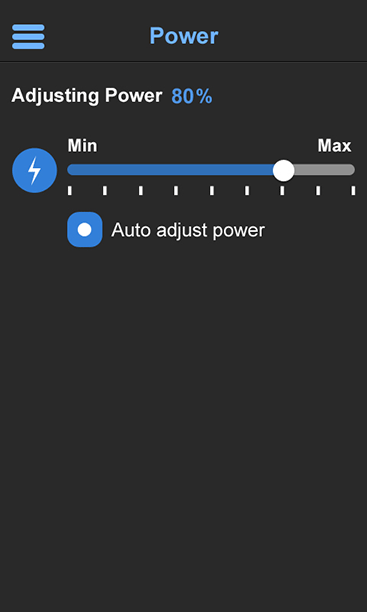 If your phone is rooted, you have the ability to manage power manually by unchecking the box, Savee will not automatically monitor energy. Note: If you reduce the power of the phone in manual mode, it may be that it becomes slow and unstable. Allow the automatic mode allows Savee to manage the power according to your needs. The memory component panel optimizes resources by releasing the surplus of memory used. The Apps button lets you know what applications are more resource intensive. By clicking the optimization level button, you get to this part where you can select one of three different available modes. Agressive: Savee will detect applications which have not a high priority and which can be closed. Strong: Savee will detect all applications that require more than normal to be closed. Medium: Savee will detect low priority applications but consuming more than normal to be closed. You can manage a list of exceptions to ignore running applications that you do not want to close. The summary panel displays dynamically the phone system information. Savee also shows you the list of opened applications consuming the most energy. 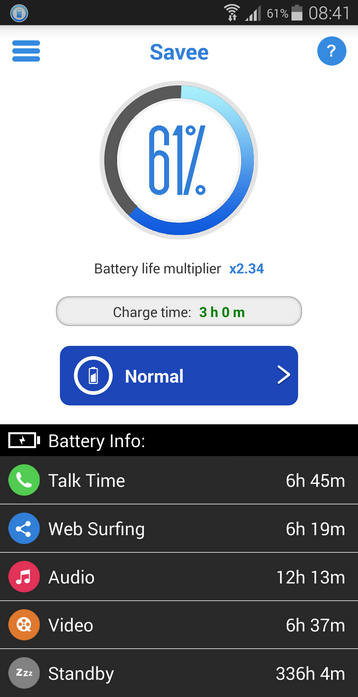 Savee also appears in the taskbar where consumption indicators are presented in graphical form with the remaining battery time, the multiplier of autonomy and the loading time. "P" means "Power" ; "M" means "Memory"; the number means the battery life multiplier. Savee has a widget to be placed on the phone's home screen. 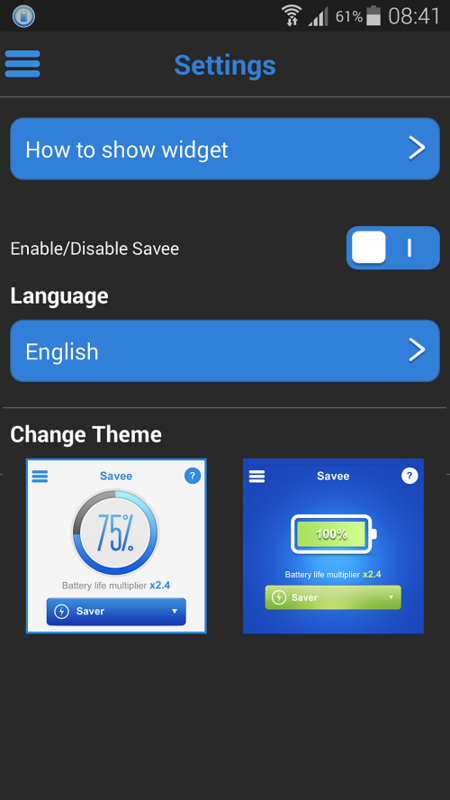 This widget includes the most common features of Savee. 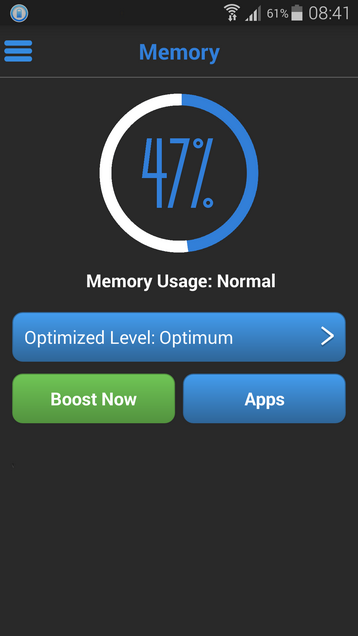 You can optimize the phone memory in 1 click by pressing the appropriate green button. You can choose the mode of consumption of the phone (Powerful, Normal, Saver). You also have at your disposal 8 buttons that allow you to manage WiFi, Bluetooth, mobile connections, GPS, sound, screen rotation, brightness and open Savee application.